Protea Hotel Select Ikeja is located at Plot 2, Assbifi Road, Ikeja, Lagos, Nigeria. It is situated in the quiet suburbs of Ikeja CBD and grants guests an enviable proximity to the Ikeja City Mall and Ikeja Golf Club. It is one of the luxurious brands of hotels owned by Marriott. Protea Hotel Select has a total of 117 stylishly furnished rooms of varying categories, which include: Standard, Family, Deluxe and Junior Suite. 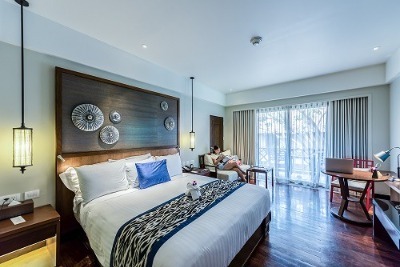 These rooms are equipped with centrally controlled air-conditioners, LCD flat-screen with cable channels, electronic safes, mini-fridge stocked with complimentary table water, a work desk, hairdryer, a mini-bar with complimentary snacks and beverages and a coffee/ tea maker. A number of facilities are available at Protea Hotel Select Ikeja. They include: free Wi-Fi internet connection of up to 500mb in data access, a fitness centre, a meeting hall, restaurant and bar/lounge where guests can select from a variety of meals and drinks, 24-hour electricity and an adequate parking space. Additionally, Protea Hotel Select Ikeja renders services such as: 24-hour front desk, laundry/dry cleaning, 24 hours housekeeping/room services. CCTV Cameras and security personnel are available to ensure safety. The nearest airport is the Murtala Mohammed International Airport which is just 5.9km away. Children: All children are allowed (Max. Age: 12years). Payment: Cash, Visa and MasterCard are accepted. Q: What is the check-in and check-out time at Protea Hotel Select? A: Check-in and check-out time is between 11:00 am and 2:00 pm. Q: Does Protea Hotel Select have a restaurant? A: A restaurant is available at Protea Hotel Select. It offers a blend of local and intercontinental cuisine, which includes a Buffet Breakfast and dinner as well as an `a la carte menu. Various restaurants are also close to the hotel. Q: Does Protea Hotel Select accept cash, cheques, cards and bank transfers? A: Cash, Visa and MasterCard the acceptable means of payment at this hotel. Q: Does Protea Hotel Select offer room service? What are the hours? Q: Does Protea Hotel Select have on-site parking? Is it free? A: A free parking space is available at the hotel. Protea Hotel Select Ikeja is a luxury hotel in Ikeja, Lagos. Wow, my stay at the hotel was beautiful. Everything was perfect, this is my second stay at the hotel. The environment was friendly, the hotel's attendants were nice and well mannered. The room was very comfortable and the convenience was very neat with the necessary toiletries. I really enjoyed my stay at the hotel. My stay was very good at the hotel.I had no issues checking in and out of the place. The customer service was excellent as well as the service delivery. The room was very clean and comfortable and all the facilities were fully functional. Good food too. Nine over ten rating from me. Have nice pictures of Protea Hotel Select Ikeja?